Masala Popcorn on a Friday night! Friday night, often a movie night in many families happened to be a movie night for me also today! Masala Popcorn also became my dinner, as many a times when one is alone for a meal, the motivation to cook just vanishes. This interesting recipe by Vikram Sunderam, the celebrity chef of Rasika tempted me to try it out. Rasika is known for its super quality contemporary Indian cuisine. I have over several occasions had celebration meals at the variety of restaurants under the Rasika group management, and never have we been disappointed! 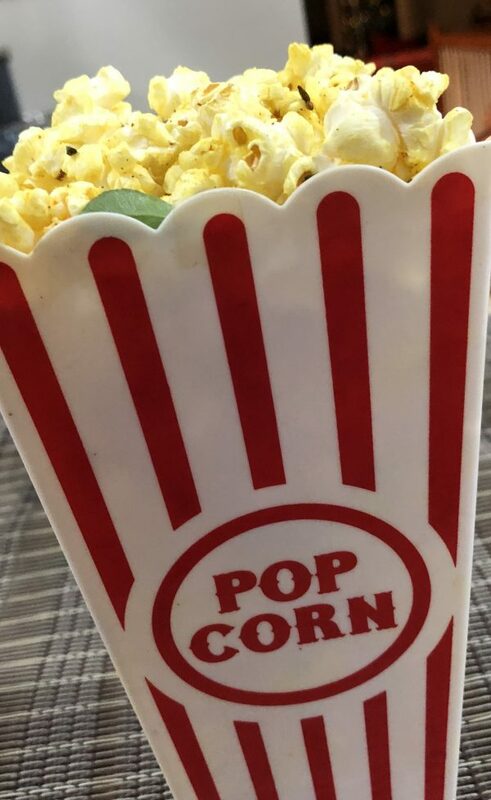 Popcorn is something I have always enjoyed. Some years back I tasted jalapeño flavored popcorn at Potomac Mills. After tasting this salty and spicy flavor in popcorn, chance of this flavor being on the top flavors are quite likely. The recipe was created with the desire to bring the flavor of Chevda, the Indian quintessential snack. As an Indian, we always look for the comfort of the spices and recreate the taste at the first chance we have. This recipe is truly a creative idea by Vikram, and no wonder this is a popular accompaniment at Rasika Bar. If I get a chance to meet him, I would probably get his autograph on the Recipe book that Rasika has just released it, and which I had the chance to get it on my anniversary. What more can a foodie ask for! I enjoyed this uniquely flavored Masala Popcorn while watching a Shah Rukh Khan and Anushka Sharma starrer When Harry Met Sejal! Movie review- A plus to Anushka for doing an amazing task of imitating a Gujjuben, and SRK is always at his best for his diehard fan! The masala in the movie was equivalent to the masala in the popcorn, with the use of cumin, coriander, curry leaves, chillies and spice level further raised by some red chili powder. 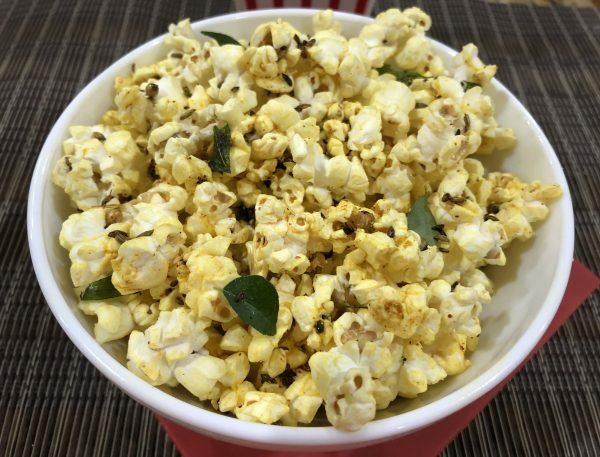 Masala Popcorn has a nice kick in its flavor, while providing a comfort meal. A two minute dinner that has all the spices, fiber and is low fat, is an interesting combination for sure. 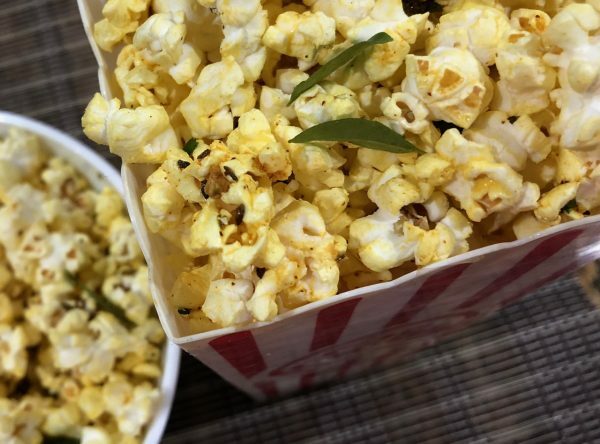 Enjoy your favorite movie, accompanied by Masala Popcorn! Create the garnish for the popcorn first. 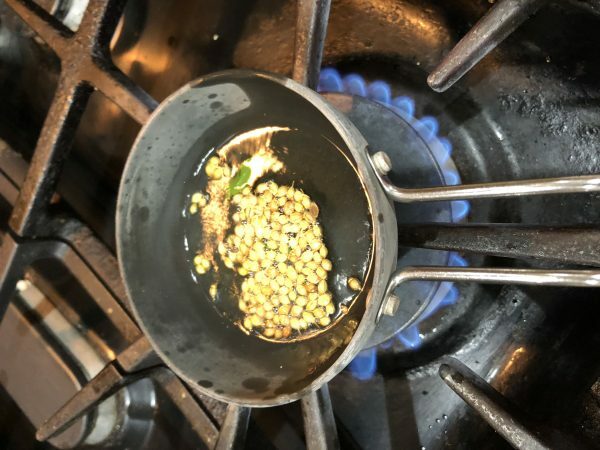 Heat the oil in a small saucepan, Once the oil heats, add coriander seeds and asafetida. Lower the flame so that garnish does not over cook. 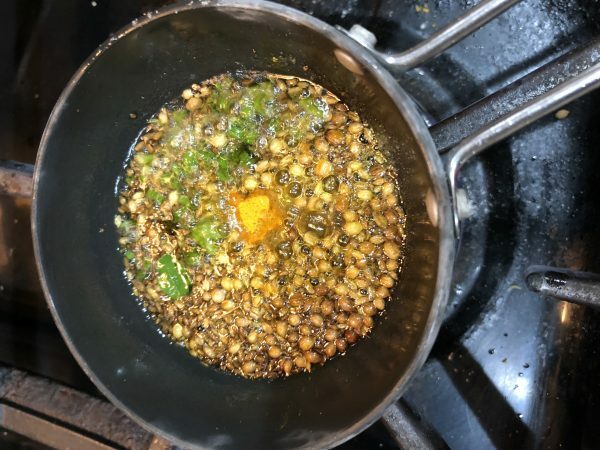 Once coriander seeds crackle, add cumin seeds. As the cumin seeds brown, add fennel seeds. After few seconds, add the remaining ingredients and remove from flame. If cooking on gas I suggest creating the garnish first, and then mixing the garnish in the popcorn and then popping it over the stove. Otherwise, follow the microwave instructions for making the popcorn. 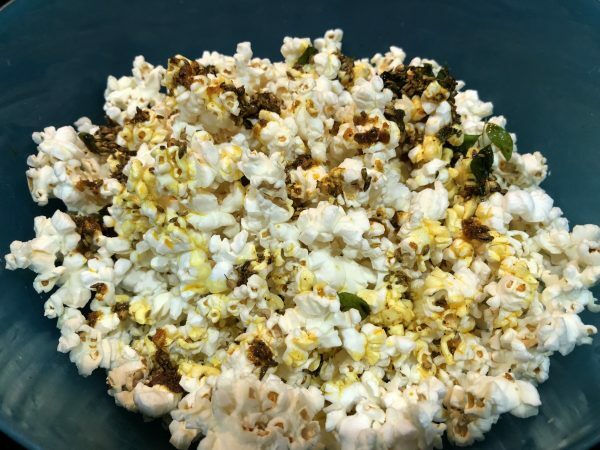 Once the popcorn is cooked, add the masala garnish and toss it thoroughly so that the flavor is well integrated in the popcorn. Enjoy a nice family evening with Masala Popcorn and interesting movie at home! Recently I came across this Masala flavored Popcorn by Swad having the spices of red chili powder, which might be a good alternative, though I have not tried it. Taste of home is the main instinct factor for most of chefs! Masala Popcorn gives a great kick to the flavor of popcorn, For the really high spice lovers, some finely chopped jalapeño will coat the popcorn well. 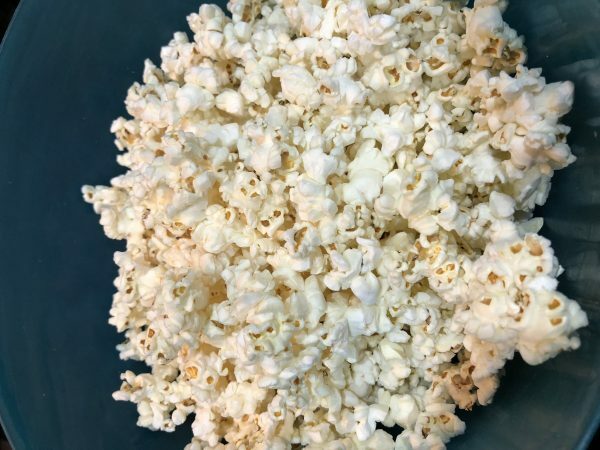 Low fat tasty alternative to the buttery popcorn, and also possible to have more, as its not so high in calories! I had two servings and enjoyed the fennel, cumin , green chillies and curry flavor in the popcorn. Masala Popcorn while watching movie, made the movie more enjoyable and memorable! Enjoy a moment of nature!